Get the sign to the top. Put in the pipe and drop it in the "pocket". 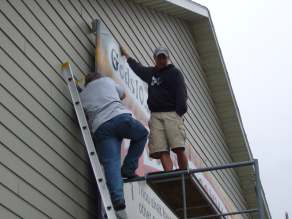 Attaching the sign to the billboard. Attach straps to the pipe and eyebolts. Gravity will do the rest. 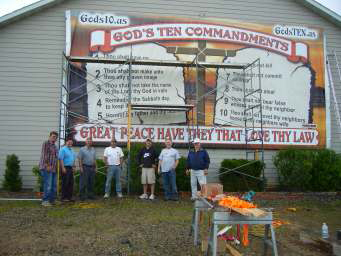 This Ten Commandments Billboard can be made for any size. Most common standard sizes are 10x20, 12x24, 16x32. The billboards are free to you. Cost of the billboards have been paid by an anonymous donor. To make this project happen, suggest you contact your local church that owns a billboard, or call a local billboard company and ask them to donate the space for the Ten Commandments for a Billboard. 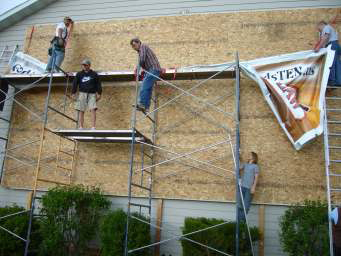 You will pay for the display and for the installation. 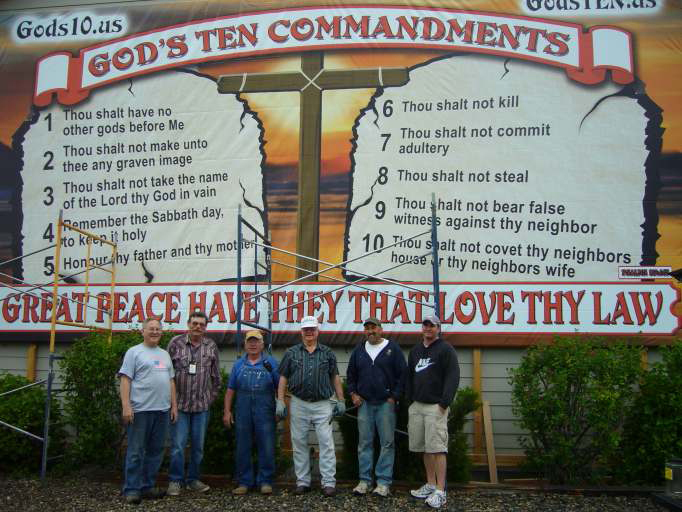 The most common situation is for a church to permanently display the Ten Commandments on the side of their building. See illustration below. Costs? We will pay for the production of the billboard. Depending on the size, most of the billboards cost will have the production cost of $150 to $250. That cost has been covered by donations. You are expected to pay a shipping cost of $50. You are further expected to pay for local installation costs and to make a commitment to have the billboard installed within 30 days. 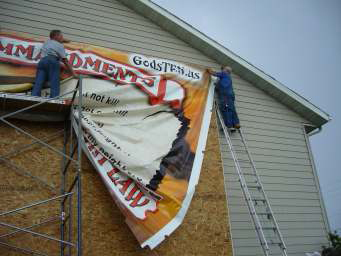 The goal is to glorify God, and bring people to repentance through the message on the billboard. The purpose of the moral law is to point out sin and bring us to repentance. If your church and community is blessed by this project, it would be appreciated if your church or organization will donate the cost of a billboard so that another church and community will be blessed. A future donation is simply a suggestion, and is not a factor or condition in providing your church with this billboard. Shipping and handling is $50, and the billboard is provided at no cost to you.